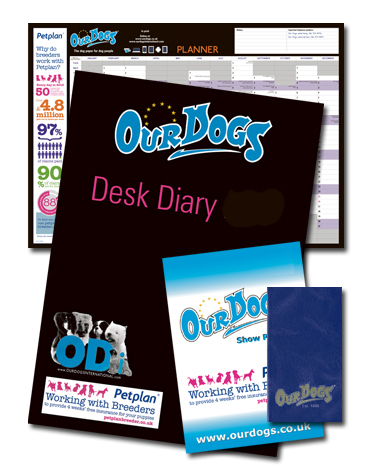 Our Dogs produce a yearly range of very popular Diaries including a Pocket Diary an A5 Planner and a Desk Diary. Our Dogs produce a yearly range of very popular diaries including a pocket diary an A5 planner and a Desk Diary. The pocket diary is a perfect way to promote your kennel or product within the diary itself where you'll be seen every day of the year by your targeted audience. For the 2019 year, we will now also be producing an A5 spiral bound desk dairy! We also have a range of top selling stationery products including puppy sales receipt books, stud service receipt books, worming certificate books, judges record books, judges ring books, stewards & show record books - Each one has the possibility to be sponsored on the front cover and back cover.